Bellmore, New York, USA. May 29, 2015. Closeup of a Tri-Wing Knock Off with thin wire attaching it to wheel on an original Black 1965 Shelby Cobra 427 roadster race car, is on view at the Friday Night Car Show, held at the Bellmore Long Island Railroad Station Parking Lot. 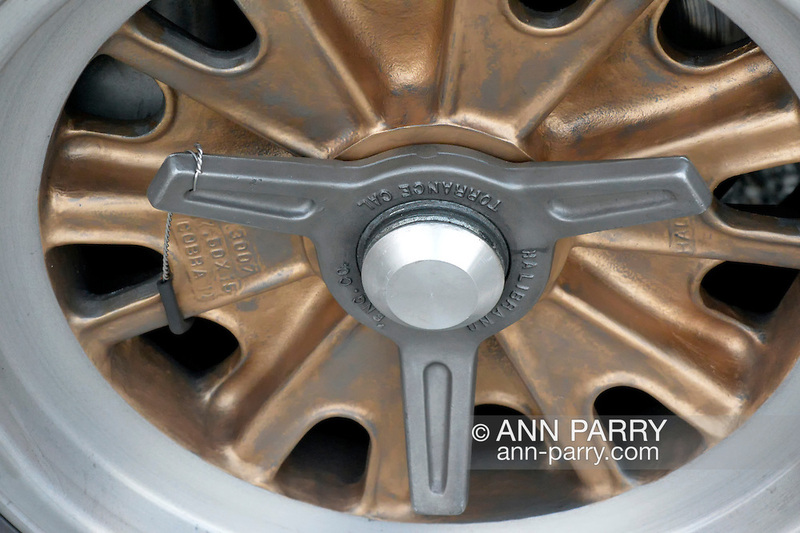 The safety wire prevents the Knockoff, aka Wingnut or Spinner, from flying into other cars if it comes off during races. Hundreds of classic, antique, and custom cars are generally on view at the free weekly show, sponsored by the Chamber of Commerce of the Bellmores, from May to early October.